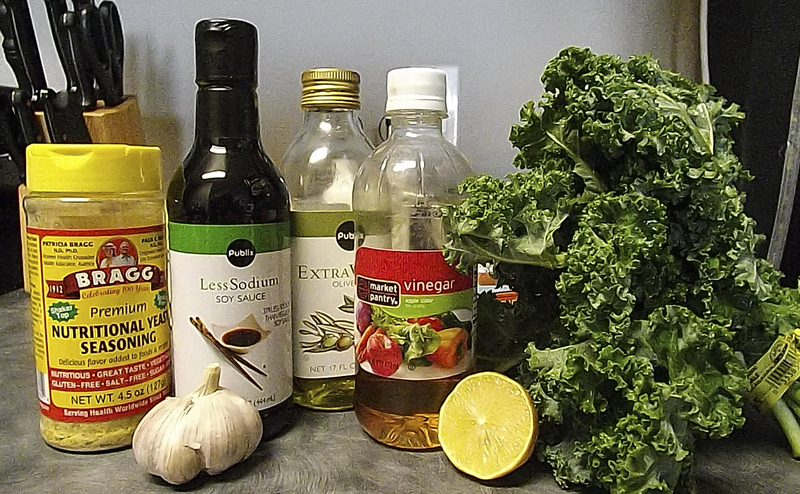 Let Them Eat Kale: Try this Garlicky Kale Recipe! I hopped aboard the kale bandwagon awhile ago, and I just can’t express how much I LOVE KALE. It is the king of all health food. 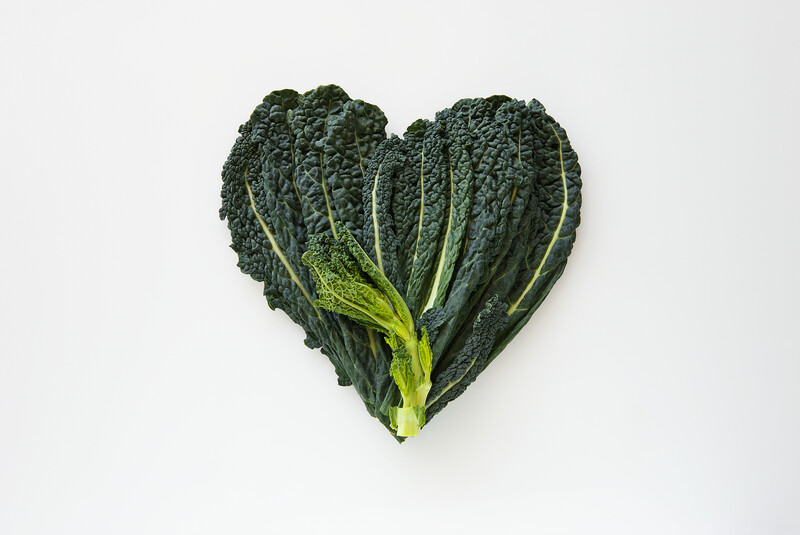 It contains the largest amounts of antioxidants within the fruit and vegetable kingdom – all hail kale! Kale is an outstanding source of fiber, calcium, iron, flavonoids, carotenoid, and vitamins K, A, and C. It gets better. At $2 a bundle, kale is cheap enough to be on any college kid’s weekly grocery list. 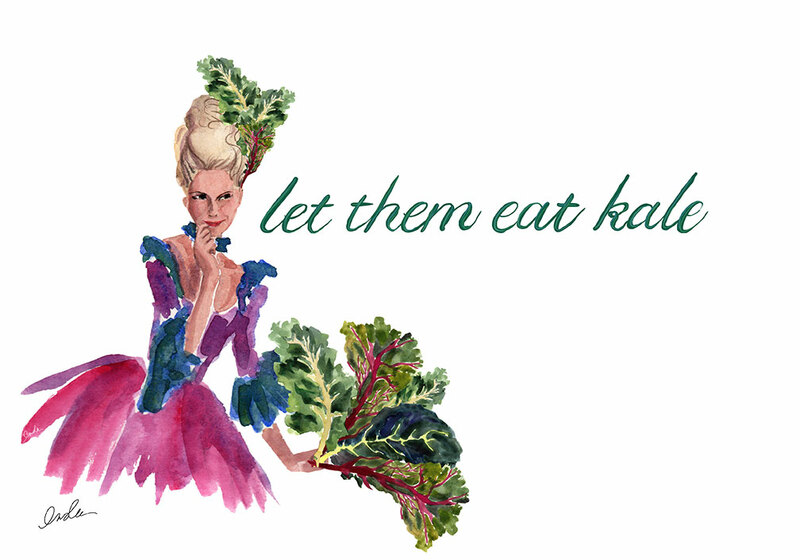 Let us eat kale. Unfortunately, kale’s naturally bitter taste and crunchy texture throws some people off. I personally love the workout my jaw gets from chewing kale, but I guess it’s not for everyone. If you’re not a kale fan, this garlicky kale recipe will change your mind. Marinating the kale weakens its touch structure, and the flavorful dressing overpowers kale’s usual bitterness. It’s deliciously addictive and wonderfully healthy. Apple Cider Vinegar: Full of antibiotic properties, this common household vinegar helps protect against infections, colds and sore throats. You can also remove stains, whiten your teeth and break down plaque by using this vinegar with your toothpaste or as a mouthwash. If that weren’t enough, it can also be used as a sunburn remedy. Tahini: Great source of calcium, protein, unsaturated fats and essential vitamins and minerals. It is particularly high in many B vitamins, which promote healthy cell growth and help reduce injury recovery time for some parts of your body. Nutritional Yeast: This little known cheese substitute is packed with protein, fiber and folic acid. Folic acid protects against cell damage and is extremely important in cell development. Good news for vegetarians, nutritional yeast is a great source of Vitamin B-12, which is a crucial nutrient for red blood cell production and brain function. Add all ingredients besides the kale into a large blender or food processor, and blend until thoroughly mixed. Break kale into smaller pieces, wash thoroughly and place in large bowl. Add desired amount of dressing to kale and mix until evenly covered. I usually use a sealable container to shake the kale and dressing together. Enjoy immediately or allow kale to marinate in dressing for 20 – 45 minutes. Marinating the kale will wilt the leaves, making them easier to chew. Refrigerate kale and dressing together or separately. I like to store extra dressing in a mason jar for later usage. Have any other great kale recipes? Let us know in the comments! Check out the most calming places on campus! Prevent Getting Sick: 3 Easy Steps to Avoiding Illness!